A lot of work goes into landscaping your yard. 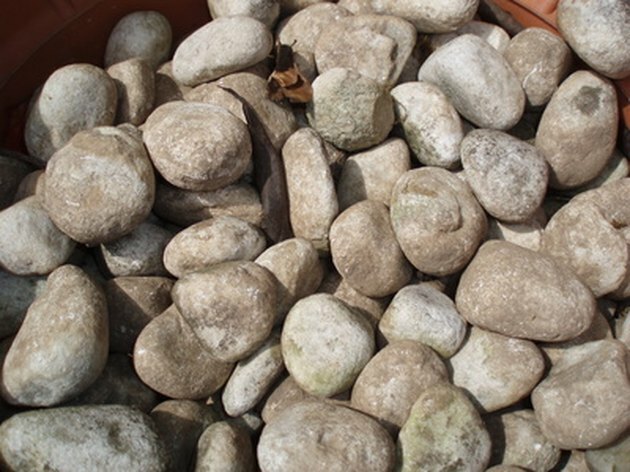 River rocks may be a nice addition to a garden, but depending on how you acquire them, they can be expensive. The work that goes into hauling and placing them can also be labor intensive. No one wants to put that much time, money and effort into a project, only to have weeds pop up between each rock. One solution is to lay a tarp underneath the rock to serve as a weed barrier. A tarp may keep weeds out of your rock garden. Clear the area of your yard or garden that you want to landscape. The first step to getting rid of weeds is ... well, getting rid of weeds. You will need to use a shovel or tiller or other tools you have at your disposal to dig up the ground. A small tiller is faster than most hand tools and generally will do a more thorough job. After breaking up the ground with tools, you will need to rake and continue to remove any remaining grass and weed roots from the garden to prevent their taking hold and attempting to grow underneath the tarp. In the event you are placing or replacing a tarp under existing landscaping, you will have to first fully remove the old landscaping material with a shovel and then begin the process of clearing the ground. Roll out the tarp over the area to be landscaped. If the tarp is not large enough to cover the area, you may need more than one. If you use more than one tarp, you will need to overlap the two so sunlight doesn't filter through to encourage weed growth. Drive garden staples through the tarp with a hammer. A garden staple looks like a U-shaped nail with two pointed ends and no head. These may be purchased at most local home improvement stores. The garden staples should be spaced approximately one to 1 ½ feet apart to hold the fabric in place and avoid shifting while placing landscaping material. You will need to place the staples around the edges and along any overlapped seams between multiple tarps. Create the border for your landscaped area with large landscaping stones or other appropriate material, positioning it so there is no room for weeds to grow between the border and the tarp. When you have framed the area, you may begin shoveling or scooping the river rocks into the area, smoothing and leveling as necessary.